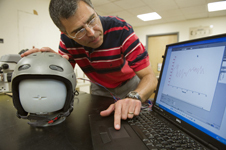 This Smart Helmet, developed by Northeastern University researchers, is designed for skiers, even though I never remember skiing with a helmet on. Of course, I never biked with a helmet on either, and I think that is a requirement now. I don’t know about wearing a helm on the slopes. The purpose of the smart helmet is to detect how much it has been impacted. Apparently, a lot of skiers are injured by hitting things like trees, rocks, and stuff. The Smart Helmet can somehow measure the acceleration and impact, and can then report any potential injury that is based on the force of the impact. There is some sort of LED light that will turn the screen red, to indicate that the wearer has a serious concussion. This will signal to the ski patrol that serious medical attention is required. Of course, this could also have a military application. Just imagine what this type of helmet could do for a hurt soldier in the field. It is a helmet that is still a concept, but I have another idea of how to improve this particular device. What if there was some panic-alert device that would send out a specific frequency to a medical team if the helmet detected a serious concussion? Think that one over, developers. Seriously! If you need a helmet to help you determine how hard you impacted your fragile skull, it’s time for a new sport haha! Too bad boxers can’t use these lmao!